The RAAL’s Alex is trying to undertake a task of horn-loading of his ribbons. I am not a big enthusiast of the idea. I am not quite sure how Alex will combine in one driver the requirements of super-tweeter and a horn-loaded MF driver, not to mention that I have many other concerns about the idea. Still, Alex is a right man to resole complex problems and let see what Alex will be able to come up be with. For omni-directional devotes this thing will have do the omni-directional tricks and for the people who would like to drive a ribbons all the way down it looks like also will has an optional horn EQ that should allow the “special” people to integrate this with their… subwoofer :-) Anyhow, Alex is the fruit that should be watched and if he desired to make public announcement of the project then the project will do through. It will be not the first horn-loaded ribbon that I have seen but I have reasons to feel that it will be better than other horn-loaded ribbons. An old anouncement of developing an omni-directional supertweeter is not really true any more. That project turned into development of big omni-directive array mid-high driver. Parallel to that one, Pro driver is on the way. Should be able to deliver "rock concert" SPL with ultra high resolution. Should work as direct radiator as well as horn loaded. Both drivers will be very serious pieces, incorporating yet unseen solutions in true ribbon design, making them statement of RAAL's capabilities. Its interesting to see that RAAL are now representing Feastrex for many countries in Eastern Europe. I wonder if they intend to create something using both types of driver! Its interesting to see that RAAL are now representing Feastrex for many countries in Eastern Europe. I wonder if they intend to create something using both types of driver! The Omni-Directional RAAL and Srajan’s mooning. Like anything else that Srajan cheerleaders at his site it has that sub-texture of superficiality and shallowness. Whatever product of company Srajan exposes himself to Srajan acts like some kind of heavy intoxicate dude who have no critical or even rational perception. Show to Srajan a middle finger and he will photograph it from 65436 angels and jump around it like a sociopath-grasshopper, apathetically singing odes to the finger’s forcefulness and strength. Was the article as an information about RAAL’s manufacturing processes? The question then would be: who the hell care? Since then the objectives of audio publications become the inner-technologies of products production? Why the stupid audio writers lead astray the one-dimensional audio readers by forcing them to read/learn the foresails about nuts and bolts of audio products? Why when we are served chicken in restaurant no one explain to us how the chicken was grew up, who was the chicken’s grandparents and how the cook marinades the damn dead chicken? Does the tasted of the chicken justifies all our interests about the chicken’s life? Why loudspeakers are different? What this Srajan does damping 5 pages about the RAAL’s manufacturing processes and with no ability to express any sane idea about Sound of the RAAL loudspeaker/s? Does Srajan targets the audio listeners - the actual beneficiaries of the Audio Results of Srajan aims to the boring products investors? So, what was the article about if it did not expose Alex’s intentions, said nothing about what Alex is trying to do and did not evaluate if RAAL actually was able to accomplish “something” with the new speaker? I have no answer. If the RALL’s intention was to build a speaker with intend just to let Srajan to do his metal Photoshop around them than the midsession is accomplished. If RAAL has nobler Sonic objectives then RAAL need to found someone else who would be able to understand truly Sonic demands, who would be able to discriminate sonic objectives, someone, who have mind and ears instead of the whoreish glitz in phonographic flash and the photo-editing “wisdom”. For a time being the RAAL’s new Omni-Directional speakers will be in Denver in a few weeks. I wish to RALL to have more discriminating and appreciative listeners and critics in Denver then they had from the “International Man of Mysterious Easy Audio Riding”. Actually, the "cameo" is a well-known iteration of the "informative" approach that has been used for some time as a way of selling stuff. And as nearly as I can tell, it works. In most cases audio, the "technically-oriented" consumer is offered some "information" that is associated with the product and for some reason this results in people thinking that by reading and accepting the info and using the product while possessed of this "knowledge", their problems are solved. Srajan's "article" might not be much more than a re-hash of info he got from Alex. If nothing else, it's "content". I don' read SE much, but it appears that if he can't find some especially nice things to say about a product, then he just throws up some "information", like a handful of very dry dust. As for Alex, it seems like no matter how smart a designer is, yet he might fall prey to his own eliptical thinking, on any level, or at some point he might not really give a crap about anything except the "business" part of it, so in the end the only thing the product has to "do" is turn a profit. Taking a little longer glance, it appears that Alex himself wrote most of the blurb as "Industry News", and it certainly looks like he has "gone Hollywood". Having lived on the "West Side", with friends in "The Business", I have seen plenty of this. As the syndrom develops, the sufferer is driven to spend more and more time with those presumed to be more Hollywood, until the sad day he is found sitting in his Mercedes, dead of apparent cardiac arrest (with soiled britches), just as the gate finally swings open for him at Harvey Weinstein's driveway. Geez , good for him ! Coming out of Banana Republic and trying to make a name for himself. Who can afford $4k tweeters if not Hollywood ?? I guess he realized that he wasted enough of his time with loosers ;0) Anyway what (mostly) american public wants -american public gets and what they want is this kind of blurb. I think he will be absolutely fine ,especially when Stereophile and Absolut will publish something simillar too. The banana republic of Audio? I do not think that the arrogant and condescending term of Banana Republic is applicable to audio thinking, particularly in today’s development of Western High-End audio. The Western High-End audio is saturated with incredible amount of idiots and uselessly higher they climb in the ladder of public industry recognition the more audio-idiotic they are. I am not kidding – make a trip visiting the listening rooms of the “biggest names” in the Hi-Fi capitals (as far as possible from the Banana Republics) and you will know the true value of your patronizing. Well, behind all those conversations about the Alex peruse to his happiness and about the Srajan-like freak to bite whatever does not lie firmly I think the most critical and important aspect of the RAAL project get lost – the sound of those things. The omni-directional concept is not too frequent in home loudspeaker and frankly it was not so often attacked seriously. I do not think nether Alex himself not anybody else knows what his speakers worth in teams of sonic capacity. I for instance very much do not like that way how Srajan/Alex used them. RAAL showed off at RMAF 2008 this new omnidirectional speaker and it is what I would be interesting to hear. What interests me in this is the concept omnidirectivity. I have no idea if the omnidirectivity as a concept is good or bad. 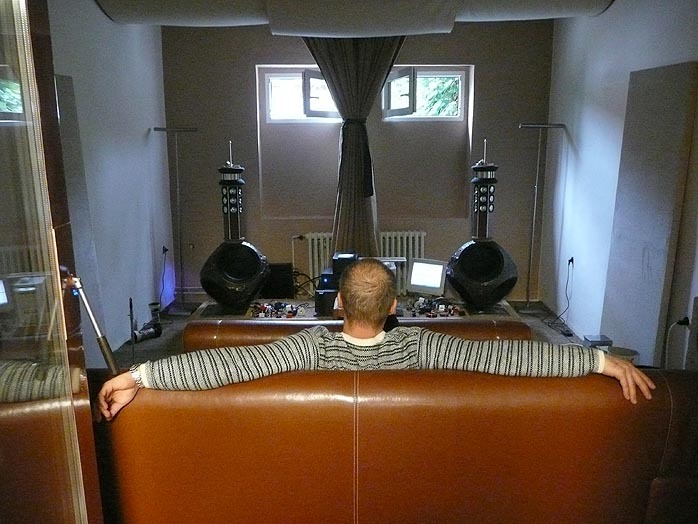 Previously I head two omnidirectional speakers – German Physics and MBL – both of them incredible crap. However, it is unknown if they were crap because they were just bad speaker or because they were omnidirectional. I would not hide that I am skeptical about omnidirectivity idea but I might be wrong, I have my reasons to doubt however in the need of omnidirectional playback. However, the omnidirectivity might be an expressive tool if it is properly used. So this is why I would be interested to hear and perhaps to learn a properly implemented omnidirectional setup. Andy Simpson, the microphone guy, if you read it then what would be your take for microphone techniques if you know that playback would be omnidirectional? Would it require treating recording processes in a different way? ...I would not hide that I am skeptical about omnidirectivity idea but I might be wrong, I have my reasons to doubt however in the need of omnidirectional playback. However, the omnidirectivity might be an expressive tool if it is properly used. So this is why I would be interested to hear and perhaps to learn a properly implemented omnidirectional setup. I believe the Morrison Audio Model 7 speakers I own are the proper implementation of the concept. Details are available here:http://www.morrisonaudio.com. Their design is entirely in keeping with Morrison's approach to the recording of music: two microphones, no mix, unamplified instruments, recorded in a non-studio setting. The conventional pair of front firing loudspeakers can not? Thanks, for posting the link. I never heard about this company. “A conventional pair of front firing loudspeakers cannot recreate a natural stereo illusion. It always sounds like a sophisticated public address system. I suppose the continued success of front firing units is due to the proliferation of PA systems wherever you go. A "live" jazz event isn't really live when everything is squeezed through a PA system. Hell, even the opera is now mic'd since most of the citizens expect things to be "loud". OK, let presume that the initial sentence is right and front firing loudspeakers are limited. Then whatever come after it (about the PA systems) is completely irrelevant to the alleged front firing limitation. The fact that “everything sounds too squeezed” is not then inherited shortcoming of front-firing loudspeakers but rather a sign of very bad loudspeakers. Possible, I do not know. What I think is important is talk about the cons and pros of the concept and do not confuse it with the success of failures of a specific implementation. Anyhow, if you feel that Morison Audio is a right implemented “360 degree dispersion at all frequencies into a solid angle” (soothing that actually never happen live) then is any place what the Morison Audio’s results might be experienced? ... Anyhow, if you feel that Morison Audio is a right implemented “360 degree dispersion at all frequencies into a solid angle” (soothing that actually never happen live) then is any place what the Morison Audio’s results might be experienced? The Morrison speakers are sold direct, so I suggest you contact Don Morrison for some options on hearing the speakers. He's a very approachable person. Is this another case where one must actually hear and be familiar with the product to comment? Zipping through some of the text, this guy sounds like the typical zealot with a good idea that has swollen up to eclipse his thinking in related areas. It's encouraging that he promptly admits to trade-offs, but he seems to pretty much brush off FR, and if he mentions/addresses any specific performance parameters other than the "correct" recreation of space/ambience/imaging, I missed it. Shades of the Bose 901. Whatever the actual worth of these speakers might be, at this point it appears to be yet another case where "objective" results/"success" would be limited by/to the stated objectives, at best. Sure, it's swell to have a nice "visual" spread/swath of "images" of "real" musicians. But what if it always sounds like a bunch of fuzzy, aberrrated, crappy musicians playing fuzzy, aberrated, crappy instruments? What if it always sounds +/- the same, given a "good" recording? While I see no good reasons why this idea could not provide a spray of sound within its limits, there are some clues embedded in the text that suggest self-satisfaction and even smugness with self-limiting objectives and means of the usual sort. But no sense in getting embroiled with a zealot, however, since he will ever return to the elliptical orbiting of his "core principles", within which all demonstrable proof resides and all issues worthy of consideration are resolved. Withal, I am glad every day for people like this, who are driven to create and to do. No telling when some good might actually come from their passions through alternative applications. So-called omnidirectional sound (of course here we are talking only about 360 degrees within a two-dimesional plane) is framed in the concept of emulating the microphone. This makes no sense to me, since it, firstly , fails to emulate the microphone. Secondly, why emulate the microphone? The idea, I would think, is to emulate the sound path of the original musical event and replicate that. The argument can be made that since we do not know the directionality of the original event (the information is lost due to the omnidirectional nature of the microphone), we can make a good approximation by reproducing omnidirectional sound. 1) not all microphones are omnidirectional. And, yes, I have heard the MBL's etc. (but not the Morrison speakers). However, I have heard the effect of the omnidirectional dispersion pattern of the MBL's etc. and I was surprised how little difference it made. Of course, MBL is a pretty intolerable speaker for a number of reasons. Still, not because of the omnidirectional pattern. This just makes it sound unnatural. Why? Only the linear beam from the speaker gets directly to your ear. The rest of the 360 dispersion bounces off the walls etc making vibrations, reflections and creating ambience and room information of your listening room. Only it is room information about a very unnatural event, namely 360 degree planar dispersion from two distinct sources, hardly a natural event. Really, I found it only tolerable in a heavily dead room, which largely was able to negate the effect of this type of speaker, but then you are left with the bad sounding speakers, which have many compromises already which they have sacrificed to create the special 360 degree dispersion. Maybe I should just be honest and say I flat didn't like the sound. Adrian explains the whys pretty well, and that's very much what they sound like to me. And in a small room (and they were playing them LOUD any time I was near, and all kinds of junk--Prince, country western...) Resonated the walls pretty badly. Hard to listen to. Good: good dynamics, would play very loud without compressing, "open" sound if you like that kind of thing. I just don't like the omni, dipole, bipole, or open baffle sound. Same indistinct, blurred sound from secondary sound bouncing around the room the reaching the ears with a noticable delay, even more noticable than the back loaded horn delay. Omnidirectivety is not a drop-in solution. Ok, as I said I am skeptical about the idea of omnidirectivety. I do see a number of objective rising problems and the most important I do not see why omnidirectivety is necessary at the first palace. People who do omnidirectivety claim that omnidirectivety images “better” but imaging I never considered as a problem with loudspeakers. There is however one aspect that not allow me to be confident with my omnidirectivety suspicion – I never was exposed to omnidirectivety done right. What I mean that any omnidirectional playbacks (or even dipole playbacks) that I have heard sounded bad not because the omnidirectivety but because they were very bad made speakers. But it is not all. The most important from my view is the fact that somebody design and implement the whole playback concept explicitly with omnidirectional objective. The omnidirectivety might be a liability for a product or something that shrinks the application of the speaker. But omnidirectivety might be an advantage if the is being used as an apperceive tool. Here is what I am not experienced at all and therefore I would hold my judgment. I know defiantly that the omnidirectional speakers must not be used as they were pictured by 6moons’ guy in the Alex home. That way I am interested to see the Federated Mike’s pictures from RMAF – to see how they were installed. I think now, as RAAL made the speakers then need to learn how to USE them, develop methodology for setting them up and flood the market with objective or fictional propaganda of exclusive advantages of omnidirectivety. Raal didn't open doors until after lunch Saturday. Said they were having problems, getting everything working, Lynn Olsen said they were having problems with the room, a bump in the 150~250Hz region and a hardness in the sound between 3 and 5 kHz. They were playing around with the crossover trying to fix it. I don't believe they're dialed in to the point of synergetic location to use the room. It sounded more like a rush to make the show. Well, this a sad reality of Hi-Fi shows. Alex is new to Hi-Fi shows and he is trying to do something better. He will go over it. More experienced vendors do not give damn about sound in their room as they understand that the “sound in the room” is not something that makes sales. Anyhow, it looks like RAAL will be hosting this speaker in a large demo room near Santa Barbara and someone who has interest in omnidirectivety might try what RALL will be able to demonstrate there. I hope they will continue working - working not on the omnidirectional speaker but rather on the whole concept of the omnidirectivety. I'd say there were fundamental issues in music reproduction which need to be got right (specifically within the design/implementation of the transducers) before worrying about the presentational niceties that omnidirectivity appears to address. Issues of tone for example which stem from the recreation of a plausible dynamic scope. Standing outside a room where a group of musicians are playing (a string quartet, a piano trio) there are aspects to the sound heard that convey its meaning, the merit of the performance and a sense of realism far more than the exact position of each individual within the room. Even stereo is in many ways simply a contrivance which doesn't inevitably guarantee the satisfactory recreation of the illusion or necessarily convey the message within the music any more effectively. None of these speakers seems to address those more fundamental issues first. With the omnidirectivety paranoia many people might loose from attention that fact that in order to be good omnidirectional speaker the RAAL new speaker has to be just a good conventional speaker first. The new RAAL speaker (does it have a name?) as I can see is 3 way design with very restricted back chambers at MF and LF. The selection of the drivers MF and LF to work in this condition and the way how Alex used them is very interesting subject. I do not think that Alex shell be talking about it to listen if the result is appealing shell be very educational. Do you what more fantasies? How about this “remote control” automatically and dynamically complies with the delta of stereo separation that sent to right and left loudspeaker. This idea combined with my idea of RT60 emulator might be a fun direction to play with. Also it might be interesting to to make a large parabolic reflector, locate them behind or on the side of the new RAAL speakers and to see if it is possible to “spook focus” of the speaker in some atypical way. I wonder how such a speaker interacts with the room and if a Lyng/tact-something is mandatory? The creasy idea of Omni-RAAL. We spoke today with Alex about his omni-directional idea. I have to admit that I did not “get” what he was trying to accomplish and I had very skeptical attitude toward to it. I was feeling that Alex moved toward to this omni idea juts because he can. To my surprise it was not exactly true and Alex had a very consciousness objectives what he was trying to accomplish with this new speaker, BTW the omni-directionality is not all that they have. I kind of overlooked behind the omni-directionality some other aspects and from Alex’s explanations of his objectives I conceded that I might understand the whole omni-directional idea a little bit too narrow. I think Alex need to do some education of public about what and how his new omni-directional version meant to be used. I have to note that even understanding now the Alex’s objectives in the omni-domain I am not convinced that I agree with them. I would say that those views might take place and have reasonable bases but how “winning” they are it very difficult to say at this point. It is very possible that with his new speaker RAAL stir up much bigger question then it is on surface? Well, I would not spoil the trailer and let Alex to talk about his views, when he will. Indeed it is so. that product hasn't got much to do with it at some point. And it makes me so sad too. I'm just glad I'm not the only person to have noticed that no matter where you start, some laziness, if i can put it that way, takes hold and the lofty goals fur further products start to, not just be less feasible, but worse, they matter less and less as time and circumstances take their toll. I've experienced it myself in my very own commercial ventures. I love how some outfits are so profitable and able to be run by playboyish types who retain the same verve and interest in the product/market, without needing to care about marketing in some ways. A nice example is Teres, while they've kind of abandoned the hobbyist, they have constantly tried big new steps, despite those being more expensive. This is really an off topic comment altogether but this point just jumped out at me.